Nine years ago in the Congo Basin, an infant chimpanzee looked on as its mother was brutally massacred by poachers. Today, that same chimp rests safe inside the Goodall Institute’s Chimp Eden sanctuary, ready to give birth herself, as the entire world watches. This chimpanzee’s sad beginning is far too common, as thousands of the species are killed each year, victims of the bush meat trade. Although poachers will usually spare the lives of the very youngest chimpanzees, even if they survive their early years these orphans are often doomed to a life of misery and abuse as illegally kept pets. Thanks to the efforts of Dr. Jane Goodall, the world’s leading primatologist, supporters and volunteers, the young female chimp now known as Nina escaped this fate. 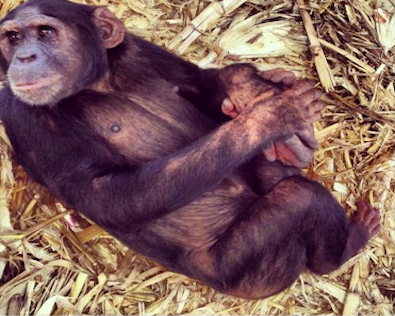 After first being kept in a Sudan zoo, she was rescued and removed to the animal sanctuary Chimpanzee Eden. Nestled within the Umhloti Nature Reserve, it is the first and only chimpanzee sanctuary in South Africa dedicated to rehabilitating rescued chimpanzees. As in most rescue centers, Chimpanzee Eden has a strict no-breeding policy, but somehow Nina’s contraceptive implant malfunctioned (hey, it happens.) After much careful consideration, the Institute has decided to share this rare event with the world. Filmed around the clock, special care has been taken to ensure that the filming process does not disturb Nina. Now in maternal isolation and due to go in to labor any moment — the story won’t end here. Because Nina was deprived of both a normal chimp childhood and chimpanzee mother role models, it’s not known if she will accept her infant once it is born, or if it will need to be hand-raised by Chimpanzee Eden staff. Watch events as they unfold and join Ustream Animals for this awareness (and eyebrow)-raising internet first. Follow the Twitter conversation about Nina on #ninachimpbirth and donate to Jane Goodall Institute South Africa Chimpanzee Eden Sanctuary.